(Nanowerk News) There is good news for the global effort to reduce the amount of lead in the environment and for the growing array of technologies that rely upon the piezoelectric effect. A lead-free alternative to the current crop of piezoelectric materials has been identified by researchers with the U.S. Department of Energy’s Lawrence Berkeley National Laboratory (Berkeley Lab) and the University of California (UC), Berkeley. The key to this success is the use of bismuth ferrite, a compound with a perovskite crystal structure, meaning it has crystal planes of oxygen and bismuth atoms alternating with planes of oxygen and iron atoms. These planes can move relative to one other when the proper strain is applied. The research team discovered that the piezoelectric effect in bismuth ferrite becomes significantly enhanced in response to the application of epitaxial strain -compression in the direction of its crystal planes. 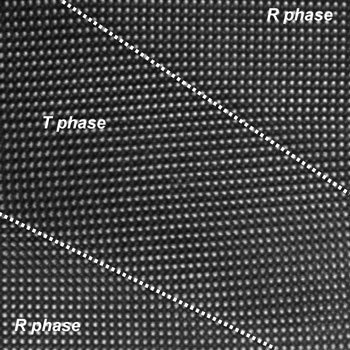 This high-resolution electron micrograph shows the boundaries between rhombohedral (R phase) and tetragonal (T phase) regions – indicated by dashed lines - in a thin film of bismuth ferrite under epitaxial strain. A smooth transition between phases is observed with no dislocations or defects at the interface. The image was produced on TEAM 0.5 at the National Center for Electron Microscopy. Piezoelectric materials, as a result of their unique crystal structures, are able to couple mechanical and electrical properties. Place a mechanical strain on a piezoelectric and an electric charge is generated across its surface. Subject a piezoelectric to an electric charge and its shape becomes deformed. The electromechanical properties of piezoelectric materials have made them valuable components in a broad range of devices, including sensors, actuators and transducers. They are especially valuable for medical ultrasounds and for non-destructive testing of roads and bridges. The most widely used piezoelectric materials today are lead-based perovskite compounds, especially lead zirconate titanate (PZT). These perovskites display superior piezoelectric properties in areas where the phase of their crystal structure abruptly changes. Such areas, known as morphotropic phase boundaries, are produced via complex chemical alloying of a PZT-type perovskite’s metal and oxide constituents. While the technology is well established, lead is a potent neurotoxin that poses a serious threat to human health, especially children, and to the environment. If the strain is removed, the bismuth ferrite crystal structure reverts back to its original rhombohedral-like phase, Zeche says. By alternating between squeezing and relaxing, the researchers can shuttle the material back and forth between the two phases. Ramesh and his group are now testing their strain-driven piezoelectric technique on other perovskites. They are also exploring the use of epitaxial strain to generate other phenomena such as magnetoresistance. Noting that the reversible phase changes in the bismuth ferrite films are accompanied by changes of a few nanometers in the height of the sample surface - a substantial change on this scale - Ramesh and his colleagues believe their results make bismuth ferrite an attractive candidate for data storage applications. The bismuth ferrite films and morphotropic phase boundaries created by epitaxial strain were characterized using TEAM 0.5, a unique transmission electron microscope created as part of the larger TEAM project. The acronym stands for Transmission Electron Aberration-corrected Microscope. TEAM 0.5 is capable of producing images with half angstrom resolution, which is less than the diameter of a single hydrogen atom. TEAM 0.5 and its successor, TEAM 1.0, are located at Berkeley Lab’s National Center for Electron Microscopy (NCEM) - a DOE national user facility and the country’s premier center for electron microscopy and microcharacterization. “The resolution of TEAM 0.5, which is currently the highest in the world for an electron microscope, made it possible for us to image the atomic structure of both the tetragonal and rhombohedral phases and their interfaces,” says Ramesh.